As a kid, chili wasn’t a food I got necessarily excited about. Then again, as a kid, I don’t recall being excited about many foods, save for my grandma’s beef stroganoff, jellied cranberries straight from the can, and the miniature fruity marshmallows. Yup, you could say my tastes have expanded over the years. Today, I get excited about chili. If I’m going to trudge my way through the winter months, you better believe I’m only going to do it with comfort foods at hand. When I made this chili a few weeks ago, Ryan commented that it was rare for me to make such a traditional chili. 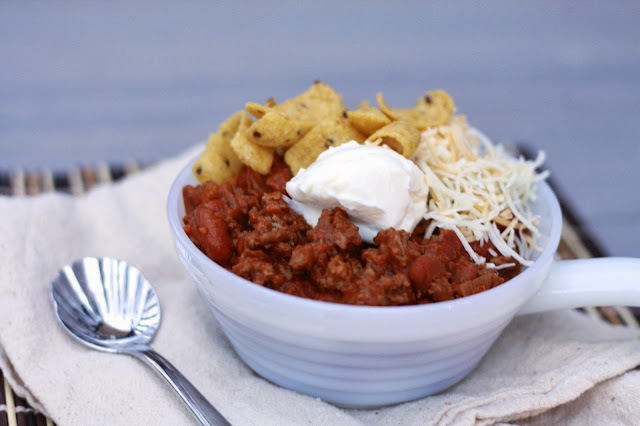 He was right—the types of chili you’ll find on this site are definitely a bit more outside the box…chili with quinoa, for instance, tequila turkey chili (a must try! 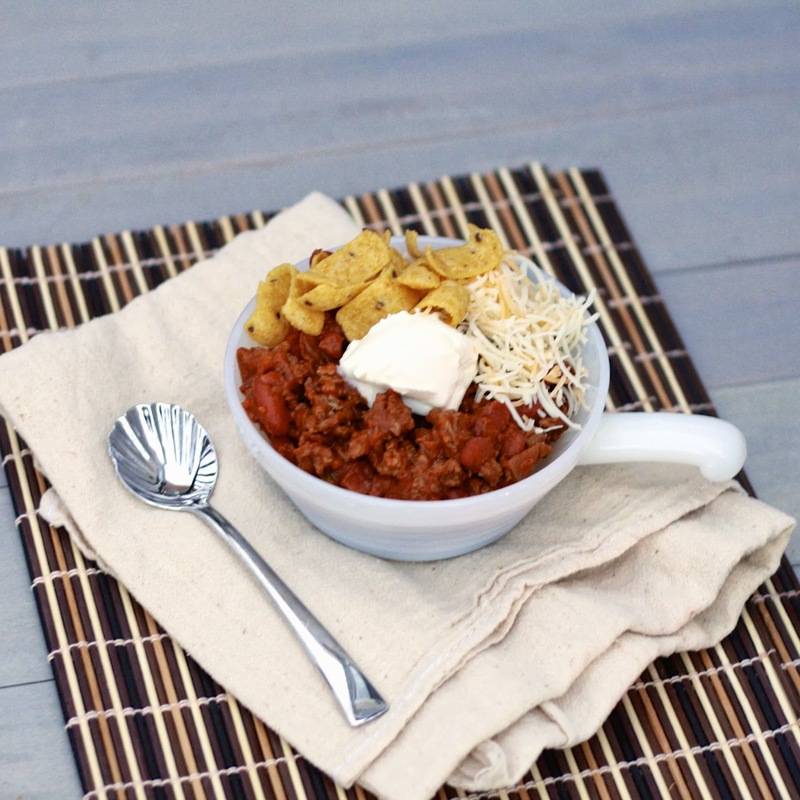 ), and of course my (healthier) spin on chili fries! Although this appears to be a no-nonsense chili, I don’t think eaters will be disappointed or bored. It’s meaty and hearty, and a little bit spicy from the jalapenos. Next time I’d up the jalapeno—the recipe calls for 2-4 and I stuck to the low end of that but would’ve appreciated a bit more heat. 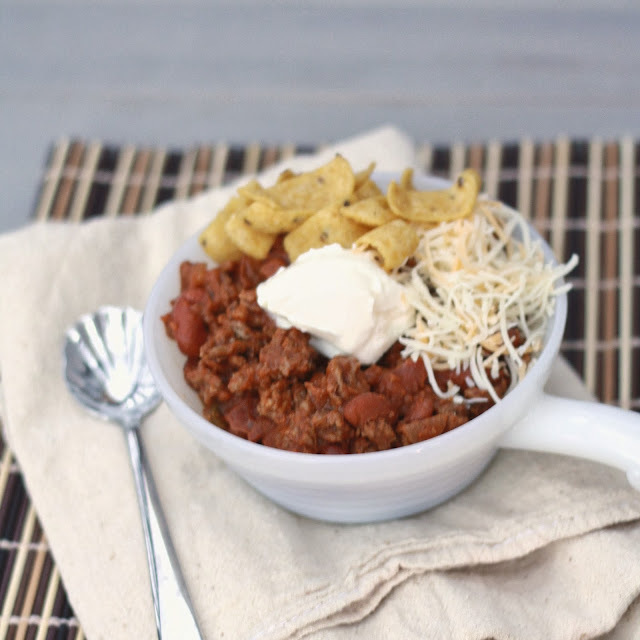 Topped with sour cream, shredded cheddar, and corn chips, this is definitely a meal to get excited about! 1. In a dutch oven or large stockpot, brown beef over medium heat. Drain off fat once browned. Add onions, garlic, and peppers to the pan. Cook for 5 minutes or until almost tender. Stir in chili powder and cumin. Cook for 1 minute, until fragrant. 2. Stir in tomato sauce and water; bring mixture to a boil. Reduce heat to medium-low. Simmer, covered, for 10 minutes. 3. Mash about 1/3 of the beans. Stir all beans into the chili (mashed and whole). Return chili to simmering and cook for about 5 minutes. Remove from heat. Stir in the chopped cilantro, chocolate, and salt, stirring to melt chocolate. Serve topped with sour cream, corn chips, and shredded cheddar.